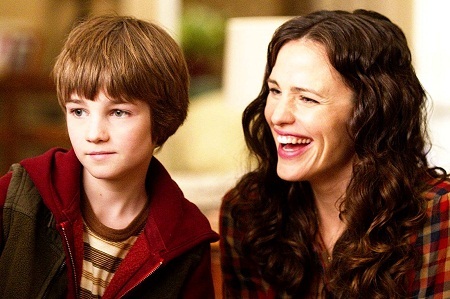 If you've seen the trailers for The Odd Life of Timothy Green, you know the deal - cute, simple Midwest couple (Jennifer Garner and Joel Edgerton) are told to give up on having a child, as one or both of them is incapable of procreating progeny. Despondent, they decide it's best to lay the matter to rest; but first, one last night where they wallow in the fantasy, writing down on scraps of paper what their nearly perfect off-spring would be like if they had been lucky enough to conceive. Papers go in box, box gets buried in garden. Thunder, lightening, wind, rain and leaves produce magical child from buried hopes and dreams. After being scrub head to toe, removing dirt and soil, but not leaves, a little boys face is revealed - so guileless and angelic, you'd think it was Michelangelo's sculpture of the Christ child come to life. Of course, it's not, it's a ready made 10 year-old kid for Cindy and Jim Green (Garner & Edgerton) named Timothy, played by adorable new comer Cameron 'CJ' Adams. At this point, I'd like to say... What you don't know about the movie... or, What will surprise you ... or, But there's a twist... No, but it's fine, family, magical Disney entertainment. Many lessons are learned by this couple who've gone from standing poolside, to diving head first into the deep end of parenting. For instance, what do you do when a kid whose only been alive for a couple of days starts "dating" a girl that's at least 2 years older? There's plenty of clean humor interspersed with themes of individuality, dancing to the beat of your own drummer, stopping to uncover beauty and giving of yourself to create small, precious immeasurable moments. 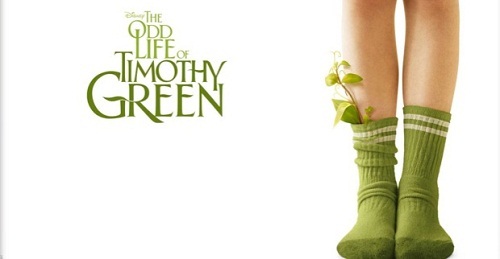 The Odd Life of Timothy Green makes for an amusing, late summer, family flick, but warn your kids, Timothy Green is no Harry Potter. Click for video featuring Director Peter Hedges giving his take on the movie at the film's red carpet premiere.